This page is for controlling merge operations. 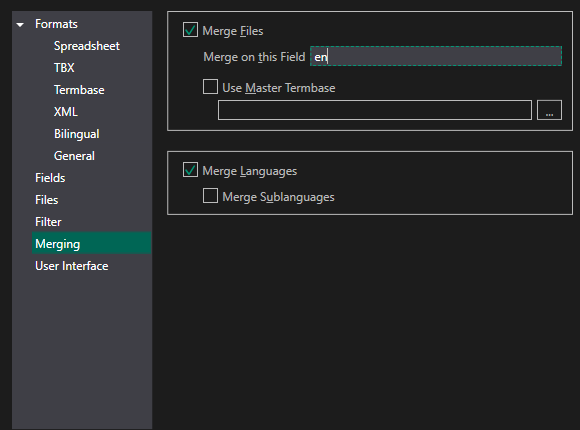 Note that to allow any merging to take place, you need to select Merge Files, the first checkbox. It acts as a master switch, since the other options don't make much sense without it. Use Master Termbase: Check this to choose a termbase to be used as a root for merging. Homonyms in this termbase will not be merged. Export Entry number: When exporting from an sdltb termbase, the entry number is exported as a field, too. Please refer to the chapter on Merging for details on the operations and examples.